A prototype of an Airbus A380 bracket made by DMLS from stainless steel powder, with conventional bracket behind. The process is being used by EADS IW to manufacture demonstration parts to explore the benefits of optimised design and production sustainability. The results from the initial joint study of AM were evaluated in terms of CO2 emissions, energy and raw material efficiency and recycling. When analysing energy consumption, the company's investigation included not only the production phase, but also the sourcing and transportation of raw materials, argon consumption for the atomisation of the DMLS metal powder, and overall waste from atomisation. In the test, cast steel nacelle hinge brackets were compared to an additively manufactured (AM) bracket of optimised titanium design by measuring the energy consumption over the whole life cycle. For this application the operational phase is typically 100 times more important than the static phases (manufacturing the part). 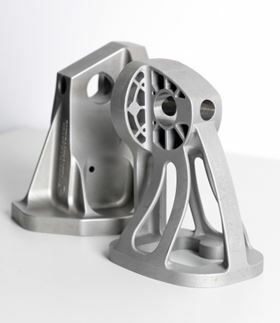 A comparison was made between manufacturing the optimised titanium component by rapid investment casting and on an EOS platform. Energy consumption for the life cycle of the bracket, including raw material manufacture, the production process and the end-of-life phase, is slightly smaller on the EOS platform compared with rapid investment casting. The main advantage of the EOS technology, however, is that the additive process uses only the amount of material for manufacture that is in the product itself. Thus consumption of raw material can be reduced by up to 75%. The study focused on the comparison between DMLS and rapid investment casting of a single part and did not take into account the question of scalability, which has yet to be addressed. The design of the nacelle hinge bracket also allowed EADS and EOS to demonstrate the potential to reduce the weight per aircraft by approximately 10 kg. CO2 emissions as a result of the brackets were reduced by almost 40% over their life cycle. “We see several advantages in the use of DMLS, mainly concerning freedom of design and ecological aspects,” said Jon Meyer, ALM research team leader at EADS IW. “We can optimise structures and integrate dedicated functionality, in addition to which DMLS can significantly reduce sites’ CO2 footprints, as our study with EOS demonstrated. A new, cost-effective catalyst made from nickel, tine and ceria can convert carbon dioxide and methane directly into synthesis gas. Metal powder producer Höganäs has introduced a magnum cartridge for customers requiring a high volume paste.